A crash of the financial and monetary system seems inevitable. This presentation connects the dots between issues like currency wars, rigged markets, central bankers’ interventions, statistics manipulation, monetary mismanagement and financial repression in a factual way that is also easy to understand. The above comments are edited excerpts by Taki Tsaklanos (GoldSilverWorlds.com) based on his summary* of a 22 minute long video presentation by Claudio Grass, Managing Director at Global Gold Switzerland (globalgold.ch), entitled The Coming Crash Of The Financial And Monetary System. The following article is presented courtesy of Lorimer Wilson, editor of www.munKNEE.com (Your Key to Making Money!) and has been edited, abridged and/or reformatted (some sub-titles and bold/italics emphases) for the sake of clarity and brevity to ensure a fast and easy read. This paragraph must be included in any article re-posting to avoid copyright infringement. Claudio Grass explains that what we learn from history is that money doesn’t come into existence by force or legislation. It is in essence a market process; where participants decide freely which medium they want to use. It has to be easily recognizable and transportable. It has to be rare so it can’t be easily reproduced and so it can act as a store of value. Gold and silver fulfill these criteria, have an intrinsic value and are free of any counterparty risks. Therefore, it is clear why, historically, they were the most wide spread medium of exchange used over a time period of over 5000 years. Even the USD became the world currency reserve because it used to be a property title for a certain amount of gold while now it is just a debt security. The Dollar, as well as all other currencies worldwide, have transformed from an “I-own-something” to an “I-owe-you”. Because we believe that history rhymes we are certain that the Dollar and all the other paper-money systems are going to collapse eventually. we are close to a collapse of the current long term debt cycle. we are at the top of a long-term debt cycle, therefore it is likely that we will see some deflationary shocks in the future. It is our understanding, however, that central banks will try everything to avoid this by printing money to cover up the current problems which will lead to hyperinflation in the coming years. A deflationary collapse would be a “Black Swan Event” which become more probable the more the system is centralized. our current credit based paper monetary system induces excessive credit, which can be seen from the fact that credit has increased exponentially since the gold window was closed. liquidity is definitely not going into the private sector. As you can see the monetary base spiked tremendously since the outbreak of our current crisis. Only in Europe it is visible that since last year the monetary base is contracting on a relatively high level. ince 2009, this correlation has increased to 86%. The FED study argued that without the intervention by the central bank, the S&P 500 would be 50% lower. The chart on the left below shows how our markets are rigged by the FED! If you exclude the days prior, during and after the FOMC meetings of the FED you see that the performance of the S&P would be considerably lower: 440% vs 170% without FOMC. The chart on the right below shows that the velocity of money is sinking so we are not yet seeing any considerable inflation. However it is visible that money is flowing into financial assets, such as stocks, and is creating inflation there. Then there is the manipulation of economic and financial statistics to hide the true state of things. The unemployment figures are one of the striking cases. In the U.S., the U-3 unemployment rate is the monthly headline number. The U-6 unemployment rate is the Bureau of Labor Statistics’ (BLS) broadest unemployment measure, including short-term discouraged and other marginally-attached workers as well as those forced to work part-time because they cannot find full-time employment. [The chart below shows that when] Shadow Stats calculated the unemployment rate using the old U.S. methodology, these figures are nearly 4 times higher than the U3 figures. Data manipulation anyone? With an unemployment rate of nearly 25% I think it is clear that we are far from any form of recovery. The truth of the matter is that central bank intervention and manipulation is only “kicking the proverbial can down the road.” In reality, the stimulus is not producing real growth, which should not come as a surprise. the previous four recessions and recoveries from 1973 to 2001. The red line…shows the current recovery. Although the FED has injected trillions of dollars worth of liquidity, unprecedented in history, the real economy is still worse off than in every other recession before and it is not foreseeable that this is going to change any time soon. In this regards we should not underestimate the creativity of governments. The U.S., for example, decided to change the calculation method for the GDP by July 2013. Research and development costs and costs for creating intangible assets such as movies, books etc. have since then be considered as “investments” and have been added to the value of the GDP. The effect of this adjustment is USD500 billion or an additional 3% growth annually than if one uses the old methodology. This new and “improved” calculation method will become the international standard and will bring “growth”to Europe, as well, starting in September of this year. Where does all this leave us? And what is the role of precious metals in this? under your direct and unencumbered ownership. Under these circumstances it will fulfill its role as your monetary insurance. Gold and Silver have a value in itself, they are a store of value with no counter-party risk and they don’t even need a rating agency. In closing, we want to refer to John Exter, an American economist and former central banker who devised an inverted pyramid of asset classes in terms of risk and market size. At the bottom of the inverted pyramid is gold – the asset class with the least amount of risk but also the least available according to Exter, in a low risk market, with positive inflation, money moves up the inverted pyramid away from gold and more towards derivatives and paper markets. Conversely, in a bust, people flee down the pyramid to their safe haven, being gold. 3. Many Economic Cycle Theorists Believe 2014 to 2020 Is Going To Be Pure Hell For the U.S.! 7. 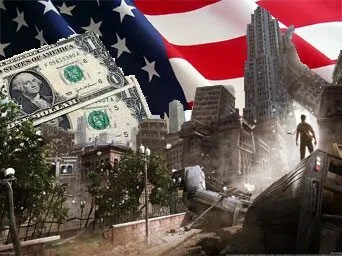 There Are 11 Stages of Economic Collapse – Where Are We Now? I believe that Silver should be added to the Inverted Pyramid right next to Gold since like Gold people will use it as protection against declining value of flat (paper) money!